Cable free headphones. 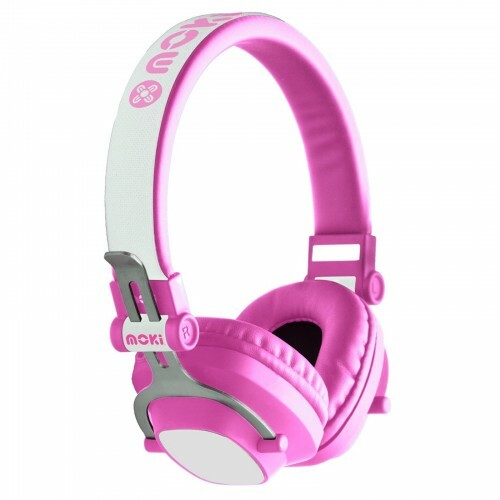 Moki EXO Kid’s Bluetooth® Headphones give kids the freedom to listen to their favorite tunes or watch movies completely cable free. With full Bluetooth® control directly from the ear cup, these headphones allow you to play / pause, skip / rewind or adjust volume without touching the phone or play device. With a restricted sensitivity of 89dB, Moki Kids Safe Volume Limited Blue and Red Headphones are ide.. Invest in a pair of kids headphones with a restricted sensitivity of 89dB. Moki Kid Safe Volume Limi..
With a restricted sensitivity of 89dB, Moki Kid Safe Volume Limited Yellow & Blue Headphones are..
To help prevent damage to your childrens ears, Moki has designed a range of Volume Limited Kids Head..
Moki Volume Limited Kids Headphones are ideal for children as they help prevent damage to young ears..
Em's for Kids Headphones have a restricted sensitivity of 85dB, and feature SNR 19dB external noise ..
MPN: ACC-HPLILPK Newest range from Moki. Lil' Kids Headphones are both colourful and practical. Thes..